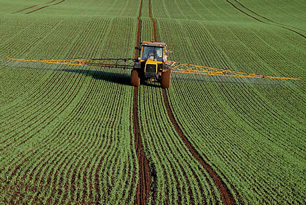 Paraquat dichloride (also known as paraquat) is a commonly used herbicide used to control broad-leaf weeds on a wide range of crop and non-crop areas. It's also used as a crop desiccant (drying agent) and defoliant. It's a quick-acting, non-selective compound that can destroy plant tissue on contact. In the 1970s, it had a widely publicized use as a method for government agencies to destroy fields of marijuana crops in the U.S. and Mexico. Paraquat adsorbs readily to soil, and so is “not expected or considered to be a groundwater concern” according to the EPA. Paraquat is highly toxic. Ingestion can cause gastrointestinal symptoms, including abdominal pain, loss of appetite, nausea, vomiting, and diarrhea. It can also affect the heart rate and cause damage to lungs, kidney and liver. It is not believed to be carcinogenic. Water contaminated with paraquat dichloride can be treated with activated carbon.